For Mohammed Ali Aziz-Sultan, MD ’99, the scant steps between his seat and the podium at the 63rd Annual Alpha Omega Alpha (AΩA) Banquet and Induction Ceremony on May 17 could not have served a sharper contrast to the distance he covered to make that moment possible. Aziz-Sultan nearly lost everything when his family fled the Soviet invasion of Afghanistan when he was just 6 years old. Aziz-Sultan and his family made their way to neighboring Pakistan in the back of an old pickup truck. From there, the once prominent family, led by pair of OB/GYN MD-PhD parents, endured a succession of moves until settling in northern Virginia. At no point along the way did Aziz-Sultan imagine he might one day become a successful neurosurgeon, much less the 2018 AΩA-Alpha Chapter Visiting Professor and the George Washington University (GW) School of Medicine and Health Sciences (SMHS) alumni inductee. After graduating from GW in 1999, Aziz-Sultan set his sights on “the top” of the medical world, which for him meant neurosurgery. He completed a neurosurgery residency at the University of Miami, followed by endovascular fellowships in radiology and neurologic surgery, and a fellowship in skull-based and cerebrovascular surgery at the Barrow Institute in Arizona. In 2013, he joined the faculty of Harvard University as associate professor of neurosurgery and currently serves as the fellowship director and chief of vascular/endovascular surgery. Aziz-Sultan is also a co-founder of the William Zarafi Foundation for Children with Brain Cancer, the director of the microsurgical laboratory, and the co-director of the Comprehensive Stroke Center at Brigham and Women’s Hospital. Earlier in the day, Aziz-Sultan presented the 11th Annual AΩA Visiting Professor Grand Rounds Lecture, titled “Stroke Therapy and Innovation in Medicine.” The lecture serves as one of the unofficial kickoff events to the weekend’s commencement ceremonies and gives the GW chapter of the national medical honor society the opportunity to host a national leader to address issues relating to science, the art of medicine, and professional values. In his address, Aziz-Sultan described the clinical evolution of care for stroke patients, one which mirrored his own professional journey. Microsurgery was revolutionized in the late 1960s with the advent of the surgical microscope, offering neurosurgeons a small window into the brain. Peering into the scope, neurosurgeons could travel down the fissures between the lobes of the brain to find the affected vessels, where they could place a tiny clip over the aneurysm. “That took me seven years to learn,” Aziz-Sultan said. While he was honing these surgical skills, he added, the fields of radiology and endovascular surgery begin to emerge. “People are starting to make real gains in the field by the mid-2000s … taking catheters through the femoral artery, just like the cardiologists.” Fishing these catheters into the brain, physicians placed tiny coils in the vessel to treat aneurysms and prevent life-threatening bleeds. Soon a turf war broke out, pitting microsurgery against endovascular, clips versus coils. Aziz-Sultan, nearly a decade into his training, decided that, rather than join microsurgical resistance and fight an endovascular revolution, he would instead learn about it and add it to his growing skill set. The emerging endovascular procedures enabled surgeons to do in an hour or two what once took 15 hours to accomplish. Each time a new technique or piece of equipment was developed, Aziz-Sultan explained, it removed another petal from the neurosurgical bloom. “So, what do you do?” Aziz-Sultan asked. “Are you all this field or all that field? Or are you somebody who takes new ideas from different places and tries to incorporate them and try to come up with something even better? That’s what we did [at Brigham and Women’s Hospital].” Aziz-Sultan and his team paired techniques from radiology with those from neurosurgery, and created a hybrid operating room where he could tackle unique cases that previously weren’t possible. This 2018 class of AΩA inductees included 29 members of the SMHS MD program Class of 2018. 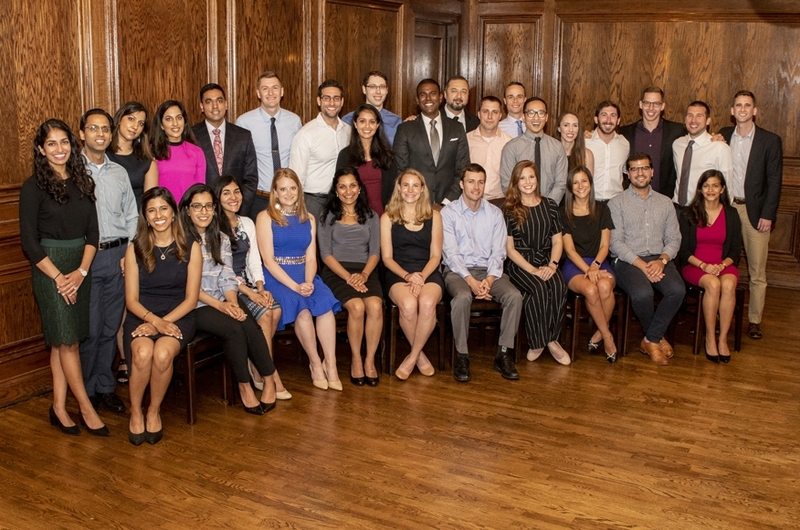 Only the top 25 percent of graduating medical students are even eligible for nomination to the society, and this year’s class represented the top 17 percent of GW’s MD program. In addition to the graduating students, three residents (Sarah Cigna, MD, Joe Delio, MD, and Caitlin Mingey, MD), two full-time SMHS faculty members (Robert Shesser, MD, RESD ’79, professor and chair of emergency medicine at SMHS, and Stephen Teach, MD, professor and chair of pediatrics at Children’s National Health System and associate dean for pediatric academic affairs at SMHS), were inducted into the Alpha Chapter. Carolyn B. Robinowitz, MD AΩA ’99, clinical professor of psychiatry and behavioral science at SMHS, was also honored for her years of service to GW and SMHS, receiving the 2018 AΩA Alpha Chapter Voluntary Clinical Faculty Award. The annual event was organized by Angelike Liappis, MD ’96, FIDSA, associate professor of medicine at SMHS and secretary of the GW chapter of AΩA. This year’s student inductees will go on to represent GW and the Alpha Chapter of AΩA at residency programs from some of the leading medical institutions across the country.